he nuts can be prepared a day in advance and stored in an airtight container at room temperature. 1. For the nuts: Preheat the oven to 350F. Lightly grease 2 baking sheets with nonstick cooking oil spray. 2. In a small bowl, combine the honey and water. Add the pistachios and stir to coat them evenly. Spread the coated nuts in a single layer on one of the baking sheets. Bake for about 10 minutes, stirring once, until the coating is just beginning to bubble. Immediately transfer the hot glazed nuts to the other prepared baking sheet, spreading them in a single layer. The nuts will crisp up as they cool. 3. For the dressing: In a medium bowl, whisk together the mayonnaise and mustard until well-combined. Add the milk and lemon juice. Add salt and pepper to taste. 4. For the salad: Halve the endives lengthwise and cut out the triangle-shaped core at the base of each one; discard the cores. Cut each piece lengthwise into thirds, then crosswise into pieces about 1-inch long. 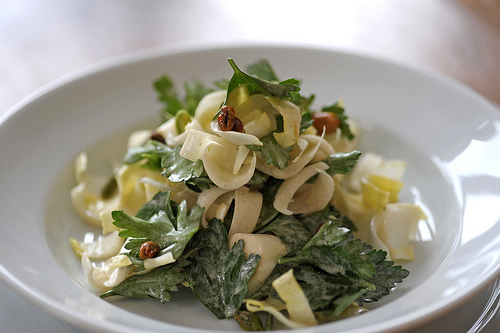 Combine the endive and parsley in a large bowl. Toss with enough dressing to coat the salad evenly (you may use all of the dressing). Divide among individual plates; sprinkle the cooled nuts over the salad and serve immediately.